The GMPE Hood Glaucoma Report highlights essential diagnostic information in an intuitive layout that enables a quick, yet comprehensive assessment. Based on the diagnostic approach developed by Donald C. Hood, PhD, this report also accentuates the importance of high-resolution OCT B-scans and the unique anatomy of each eye, in the routine clinical diagnostic regimen. “With the NSTIN plot, the temporal quadrant of the retinal nerve fiber layer is displayed in the center of the B-scan. This portion of the disc is crucial for everyday visual function, and identification of abnormal thinning in this region is essential for managing glaucoma.” said Dr. Hood. Furthermore, this report allows clinicians to visualize functional and structural measurements along with high-resolution OCT B-scans and relate this information to 10-2 and 24-2 visual field points. Taking advantage of the GMPE Anatomic Positioning System (APS), which tailors scan placement and orientation to each patient’s individual anatomy, the report is optimized to serve as an intuitive and robust diagnostic aid. The unique semi-automated APS technology increases the precision and accuracy of results by ensuring that all glaucoma scans are anatomically aligned with the reference database and account for the individual configuration of axons in each eye. “The GMPE Hood Glaucoma Report makes full use of the high-quality images and precise diagnostic information provided by the SPECTRALIS to make it even more convenient for clinicians to identify subtle changes and make confident clinical decisions,” stated Ali Tafreshi, Head of Product Management and Clinical Affairs. The SPECTRALIS is an ophthalmic imaging platform with an upgradable, modular design. This platform allows clinicians to configure each SPECTRALIS to the specific diagnostic workflow in the practice or clinic. Options include: OCT, multiple scanning laser fundus imaging modalities, widefield and ultra-widefield modules and scanning laser angiography. 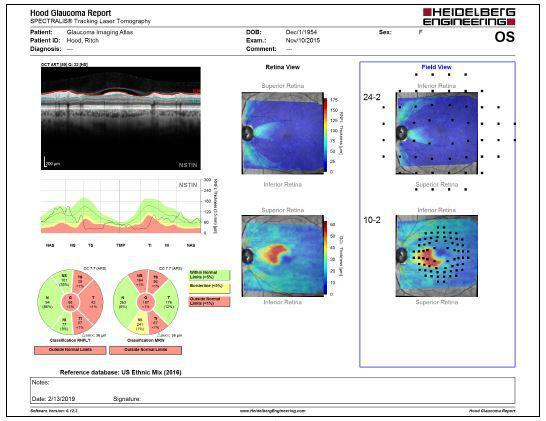 The SPECTRALIS Glaucoma Module Premium Edition combines the proprietary Anatomic Positioning System (APS) with a series of unique scan patterns to assess the optic nerve head, the retinal nerve fiber layer, and the ganglion cell layer. These scan patterns are precisely matched to the characteristics of fine anatomic structures relevant in glaucoma diagnostics. Heidelberg Engineering’s growing product portfolio combines these core technologies: confocal microscopy, scanning lasers and optics, optical coherence tomography (OCT), real-time image processing and analytics, multimodal image management solutions, electronic medical records (EMR) and data mining.